Available to you at no charge! 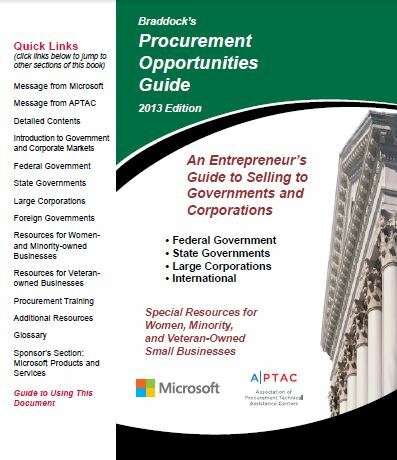 Braddock’s Procurement Opportunities Guide is a primer designed to help small business owners and decision makers understand the government procurement and private sector procurement spaces. The Guide provides an overview of government and corporate markets with an emphasis on who buys and how buying decisions are made. The Guide also presents “next step” resources for federal and state governments and the private sector. An Updated Version is Coming Soon! – A glossary of procurement related terms, a procurement preparation checklist, information about teaming agreements and joint ventures, and more. This special APTAC PDF edition of Braddock’s Procurement Opportunities Guide will be available at no charge to PTAC staff members and clients. Braddock’s Procurement Opportunities Guide is published and copyrighted by Braddock Communications, Inc.